1)Please fully charge before first use. 2)Before use, make sure to use the power switch is correct. 4)Solar panel in the strong sunlight can quickly charge. Under dim sunlight it can be recharged slowly. The charging time depends on the intensity of the sunlight. The lighting time depends on the intensity of the sunshine and the length of time. 1. 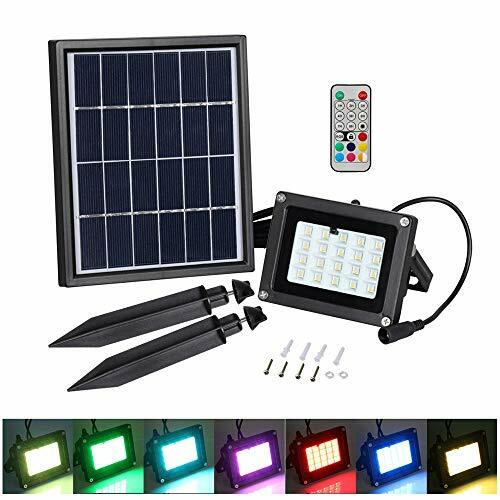 20 RGB LEDs Solar Spotlight -- Use 20 RGB LEDs, super bright, life up to 50000hrs. 7 kinds of color can change automatically: Red, Green, Blue, Yellow, Purple, Orange, Cyan. Or fix one color you prefer by remote control. 2.Solar Powered -- The design of tempered glass with solar panel and lampshade all in one, do not aging, do not fade but longer life.Energy saving and environmental protection, toward the sun can generate electricity, zero power consumption, no pollution. Maintenance-free. 3.Light Control Mode -- The lights are automatically charged during the day and are automatically lit at night. 4.Easy Installation -- Easy to mount it on the wall with provided screws to use your solar LED as floor light, tools and wiring are not required. Ideal for exterior lighting like railway, garden, lawn, ect..
5. Waterproof -- Designed to withstand dust and water jets. No need to worry about rainy day or any bad weather. Perfect suitable for Park, School, Garden, Hotel, Villa, Street, Garage and etc.. If you have any questions about this product by T-SUN, contact us by completing and submitting the form below. If you are looking for a specif part number, please include it with your message.